This book is the line of teaching now undertaken in Russia – it is the result of the author’s own investigations and conclusions. It takes a slightly different line to that taken in teaching in the western world. There is lots of great information filtered through the book, but it may not be picked up by a newcomer because of the concentration the author has on his new theories and interpretations. I don’t doubt, as he says, there is too much emphasis on horse conformation in the terms we use in dogs, but that ‘speak’ has now been in use for over 100 years, why develop a new language and culture if it is only about words. Of course, again, a lot is lost between the original Russian which the book and concepts were conceived in, and the translation into English – the same will happen when translating English to Russia. Yet, like a diligent author, the author says he has had the book extensively reviewed by English speakers, but the language still occasionally changes, the one thing that particularly sticks in my mind is ‘sabre’ compared to ‘sickle’ hock, but there are other examples too. The author’s rationale for publishing is to present his findings on his studies – and a sensible thing to do, but to present to novices, newcomers, and those only lightly acquainted with dogs bred for beauty or other functions with proportions and rules and angles, and relating that to Da Vinci’s Vitruvian Man (Canon of Proportions or Proportions of Man) I think is just asking too much. Yes, a dog should be in ‘proportion’ within itself or at least in balance or harmony – which allows it to have grace with power, power to perform its function with fluidity and grace and minimal but productive energy. Let’s be open and honest, one, not everyone finds the Vitruvian Man ‘ideal’, and two, not all men are built in his form. A great sprinter does not have the same proportions as a builder. Eugene Yerusalimsky does not expect every breed to conform to his overall proportions theories, nor every individual, but time and time again, the book tends to fall into indicating this with the only codicil being unless required/not required by a particular breed’s standard. At least he is not for re-writing breed standards, and of course all dogs share many common points (number of limbs, etc) and the underlying basic anatomy is the same – but so often in the book we are lead back to the Doberman. The Dobermann is the breed that got Eugene Yerusalimsky interested in this topic, and the ‘evolution’ he demonstrates of it into the Borzoi (for example) is interesting and could help the regular owner and breeder come to grips with dog anatomy and form. This, yes, of course, does prove the point that while dogs are similar and can easily be identified as dogs in whatever form their breeds has evolved them, that there is not one simple way to lay a ruler across all breeds to give an easy answer for the judge or breeder. When talking of proportions (and this is only in the introductory part of the book) Eugene Yerusalimsky, relies to an enormous extent on the actual anatomical vertebrae to define portions of the body, the sacral vertebrae for the croup, etc; ideally correct, but in real life because the dog has limbs and associated muscles, that is not what we will see, we see the muscle masses, and they will define the layman’s loin, rather than the actual lumbar vertebrae. So the bulk of the forward part of the pelvis (the iliac crest of the iliac wings) and their associated muscle defines the end of the loin for the person not actually x-raying or dissecting the dog. The front edge of the loin being defined by the muscle over the last rib, and I didn’t notice discussion on the sweep and spring of ribs. Ribs ‘fly’ out to give more chest volume, and they can also sweep back to a degree. As I said, there are great points within this book, but I don’t think it is of exceptional value to the everyday dog breeder or exhibitor. I would recommend you read it at some stage, it will reinforce what you have already learnt, may help you realize a point that has been elusive, but I suggest you continue to rely on your artistic or innate eye for the overall dog, and leave the rulers where they belong, with the maths kit. Is this book of value to Clumbers, I think so in the fact the author can clearly define the difference between a galloping breed and a trotter – which the Clumber is. But I will not take anything he says at face value for the Clumber breed because of this statement: “The flabby wet heavy type: … Clumber Spaniel” (this is meant to be an example of one of several breeds not falling within his own defined types). Eugene Yerusalimsky defines his Heavy wet with ample flabby subcutaneous fat type as having flabby muscles, short neck, spreading feet, the Heavy type as having a short neck. GET REAL either he has seen a few awful Clumbers, never read his Clumber standard, or should redefine his own groupings! If he can get this wrong, what else that I am unfamiliar with has he misunderstood or poorly represented? This best selling manual is an absolute must for all who wish to specialise in this field and is invaluable for all judges, show enthusiasts and breeders alike. It has received glowing endorsements from nine top international show presidents which can be found inside the front and back covers of the book. The author has a phenomenal record as an international judge having imparted his expertise in 34 countries at the very highest level. 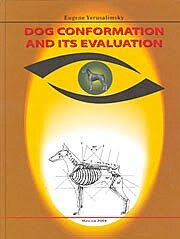 This volume will expand your knowledge of canine conformation and enable you to view the subject in entirely new ways. He explores his subject from the traditional view before considering the aspects of biomechanics and “the Golden Section” (the harmony of the dog). A truly outstanding work of 192 pages illustrated with clear and informative diagrams and line drawings. Not to be missed – Only available in UK from OUR DOGS.